They say that you don't miss a thing until it's gone. Well, I'm certainly missing my news reader, Feedly, which has been unavailable for most of the last 24 hours, apparently due to a denial of service attack in which some nice people demanded a ransom from Feedly. 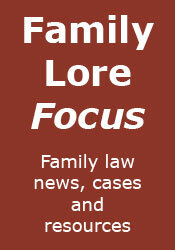 The result of this for me is that the news on Family Lore Focus and my @familylaw Twitter feed may not be quite as up to date as it should be. Still, I suppose that is the sort of price we must pay for sharing the internet with those who don't deserve nice things. Moving swiftly on, there have been some news items that have reached my eyes this week. As is well known, the President never sleeps. Not content with telling us all about his reforms and handing down numerous judgments (see, for example, Re G), he gave a speech to the British Association of Social Workers in which he suggested that courts should consider ordering contraception lessons for problem parents who have had multiple children taken into care. I would have thought that this might have stirred up some controversy, but as yet I've not seen any sort of response. In the latest of a long line of freedom of information requests by Marc Lopatin we have found out that between April and December 2013 57% of parties involved in private law children proceedings were unrepresented, an increase of 57% upon the number unrepresented parties in the previous year. No surprises there. Along the same lines and with a very similar result, the latest figures from Cafcass show that in May 2014 they received a total of 2,239 new private law cases, a 55% decrease on May 2013 levels. 1. Staying with Cafcass, the case F-D v The Children And Family Court Advisory Service has just appeared on Bailii. It concerned a claim for damages against Cafcass for negligence, misfeasance in public office, and for a breach of the right to a family life under article 8. The claim was dismissed. 2.Lastly, the Ministry of Justice has just published findings from the 2012 to 2013 Crime Survey for England and Wales examining public attitudes and experiences of the family justice system. Should be worth a gander.